Have you heard of Josiah Viera? If you have, you know what's to come. If you haven't, prepare to be blown away. Josiah is just a child, only six-years-old. However, he's not like others his age. 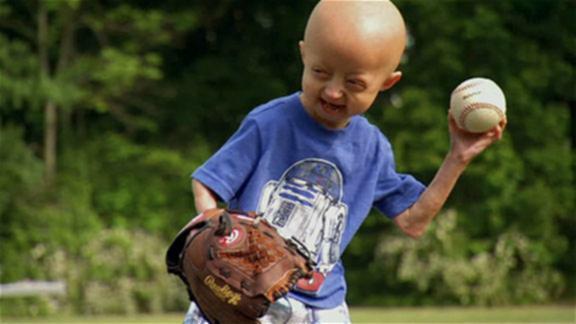 He suffers from Hutchinson-Gilford progeria syndrome, a rare disease that causes premature aging in children. This is an incredibly rare disease and currently only 13 children in the U.S. have it; 54 in the entire world. Children with this disease only live to be around 13-years-old. Josiah is a walking miracle. He knows he has a disease and that it "hurts" him, but he doesn't let that affect his love for sports, one in particular: baseball. I watched these two videos today and (excuse these links that aren't embedded -- my iPad wasn't giving me the code on YouTube for proper embedding) was brought to tears. You'd have to be a Scrooge not to fall in love with this little guy. The best part about him has to be his attitude. He acts like he's seven feet tall! Not to mention has a playful, charming personality. I wish he had a baseball helmet that fit him correctly... looks like that might be something I look into getting done. Hope you enjoy these videos as much as I did.